Nokia Indonesia, on Friday Morning (03 May 2013) launched the Most Affordable Windows Phone 8, The New Nokia Lumia 520 at JS Luwansa Hotel, Jakarta - Indonesia. Together with Telkomsel Indonesia - The largest mobile telecommunications provider in Indonesia, Nokia Indonesia start the Pre Order Nokia Lumia 520 from 03-10 May 2013 with special price and special offers. Special price for Pre order is IDR 1.499.00 for prepaid (Simpati) customer and IDR 1.793.000 for postpaid (Kartu Halo). The Pre order start on Friday, 03 May 2013 at 00:00 GMT+7. Surprisingly, Nokia Lumia 520 Red, Yellow and Cyan for prepaid customer were already sold out at the Friday afternoon, less than 24 hours from the opening. Not to wait so long, The black and white Nokia Lumia 520-Prepaid, Yellow & Cyan Nokia Lumia 520-Postpaid were already sold out on Saturday noon or less than 48 hours. And finally, This Sunday morning (05 May 2013) all the variants of Nokia Lumia 520 are already Sold out. We don't have any information about new stock for pre order. We hope that Nokia Indonesia will add new stocks for this Pre Order. We'll keep you posted when the stocks are back available again for pre order. 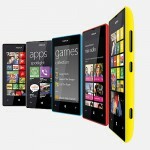 Nokia Indonesia just unpublished their Pre Order Banner and information on http://www.switchtolumia.com . We hope that this not bad signal for the stocks of Nokia Lumia 520 for Pre Order.